This is funny looking mushroom. Thai people call them mouse ear mushroom. There are available both fresh and dried. If you bought them dried, before cooking you need to soak them in water until they are tender. We can use them in many different dishes. Most often you can see them in stir-fry chicken with ginger or in clear soup with glass noodle or in salad. They taste really good in sauté with other mushroom because of their jelly-ish texture. When I was young we use to harvest this wood ear mushroom from rotten stumps of the tree that stood in the rain. Nowadays they are widely cultivated in closed farmhouse and they are available inexpensively all year around. 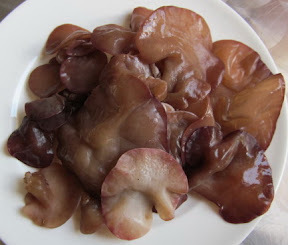 Chinese People love jelly-ish texture in their food and they also believe in their medicinal effects in wood ear mushroom.